Protoierei Nikolai Nikolaievich Ryzhkov (September 26, 1868 – February 2, 1920) was a priest and propagator of Slavic solidarity and brotherhood. He graduated from the Spiritual Academy in Kiev and lived in Vienna between 1895 and 1901, where he worked at the Russian embassy and studied at the Philosophical Faculty of the University of Vienna. He was ordained a priest in 1901 and appointed a principal of the Christian Orthodox churches in Prague and Karlovy Vary. Under his leadership, many Czechs converted to Orthodoxy, mainly amongst the Old Catholics. Ryzhkov requested Czech language to be allowed for church services. He also published church Orthodox calendars and the catechism in Czech and recorded the birth registry of Orthodox Czechs. In August 1914, he was arrested as a citizen of an enemy country and sentenced to death in a long-run trial in Vienna for anti-state activity and treason. The Russian government and the Russian Orthodox Church tried to liberate him. They managed it in July of 1917 and Ryzhkov was freed by the emperor's reprieve. However, he died soon after in Saint Petersburg. 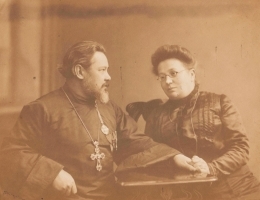 The Ryzhkov’s file comprehends his life and work from the 1890s (the university diploma, photographs) to the successful work in Bohemia and the imprisonment, trial and death. Documents from the trial (incl. Ryzhkov’s notebook) are highly remarkable. His correspondence deals mostly with the situation of Czech Orthodox Church. Another important part of the collection contains documents dedicated to Ryzhkov’s death (necrologies, speeches, articles etc.) showing his popularity and respect.